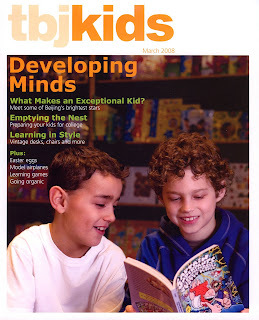 Jacob and his friend Max are on the cover of this month’s TBJ Kids magazine. It is widely distributed around here. I went into school today and saw them strutting around with copies. Read your article “Immersion by Degrees” and what amazes me is that you talked about Chinese schools emphasize on “rote memorization” instead of critical thinking. I find this to be quite a generalized statement. In a Chinese school, for subjects such as Chinese and English, there are a lot of memorizations taking place, I agree. But for math and subjects requiring logical reasoning skills, I feel that Chinese schools do a better job teaching the reasoning process than the majority of American schools. Chinese teachers design their math tests with the goal of testing whether their students have understood the concepts, the reasoning process by having students apply what they have learned in practice. You cannot pass a test with simply memorizing class notes without any understanding in a Chinese school. While in America, even at college level, I find many students simply memorize steps to solve a math problem, economics concepts, etc off their class notes and I’m amazed such a study method can always get them A’s on the tests because instructors use the exact same problems they have gone over in class on the test. Students take notes, memorize them and pass the test with A’s, and they complain a test is hard when it contains problems requiring a little more brain. To me, this is the real failure of a rote memorization based education.